Well, we've heard lots and lots of good beauty gossip about Pond's these days. And this ain't your grandmother's little jar of Pond's. Women here in the US have been begging parent company, Unilever, to sell to us, what the lovely ladies of the Philippines already know. And that is, there's something special in Pond's Age Miracle Daily Resurfacing Cream. The Pond's Age Miracle Cream was also featured on the Tyra Banks talk show last February, where it was labeled 'Asia's cult dream,' and, "it's a # 1 seller, the most awarded and it's beaten prestige brands in blind tests. The cream is one of the best kept beauty secrets of the east. " And women have been going wild trying to track some down, ever since. Who wouldn't want to rub some onto their skin? Unfortunately, Unilever has not made the Pond's cream available in the United States at this time. We have not tried this so-called miracle in a jar, but many Asian women seem to adore the product. If you have tried this Pond's Age Cream, please leave us a few comments. We are curious to learn how well the cream works. I totally agree - ponds miracle cream is commonly use by women in the Philippines. The product is endorsed by a lovely couple stars Charlene Gonzales-Mulach and husband Aga Mulach. My friends from the Philippines me their beauty secret which is Ponds Miracle Cream as they are very satisfied with the product result. THanks, Patrice. This Pond's cream is definitely worth looking into. this is a good review! unfortunately this wouldn’t suit my combination skin…but for those who love this products, just go go go and see the result. I bought it in argentina in january. In a few days the texture of the skin changed completly. People were even telling me that i look like i get facials. I also tend to have a bit of acne, and i never had break out after using it. The one thing is i used the day cream with spf. But i used it at night, or when i am going out cause it leaved my skin looking really white. 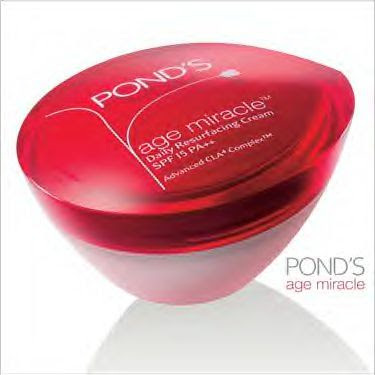 ponds age miracle is good and works on well!! PONDS COLD CREAM WAS MY LATE MOTHER'S BEAUTY SECRET. UP TO HER DEMISE AT AGE 86 SHE HAD NO WRINKLES. BECAUSE OF MY ALLERGIC REACTION TO SOAP SINCE MY EARLY TEENS I FOLLOWED HER REGIMEN. UNFORTUNATELY, THE COLD CREAM BOTTLE OF OLD CANNOT BE FOUND IN THE MARKET ANYMORE SO I SWITCHED TO AGE MIRACLE WASH. I DEVELOP ALLERGIC REACTION TO THE AGE MIRACLE CREAM ITSELF. Jumping Rope Without A Rope: A Genius Product?